My job is to teach, inspire and encourage others to "create soulful art" from paper, paint, ink, batter, dough, fabric, felt, sticks, rocks, turning it from one thing into another and incorporating a message as a reminder to you, and for myself. Payment Plans available upon checkout. *This workshop is not refundable* You are able to transfer this workshop to another person or if there is a waitlist we will connect you with the next person on the list. *Payment plans only available through March 1st, 2019. Payment in full is required when registering after March 1st, 2019. Our studio is light-filled and surrounded by wooded property that lends itself to exploring, creating and relaxing. You will have opportunities during workshops to also make your way through some of our wooded paths and find a spot to create. It is our heart’s desire that your time on our land and studio brings you rest and dreaming. While you are in the area we will make sure to point you in the right direction to all of our favorite restaurants, hiking spots, and antique stores. Our town has been ranked one of the best towns in America and we have to agree. I suggest you stay a few extra days to enjoy the beauty of Colorado! Space is limited. If you have any questions please Contact Us. Attending an art workshop at Jeanne’s personal studio is truly a beautiful and inspiring experience. From the moment you walk into her light-filled studio, you feel the warmth, love and creative energy that embodies Jeanne. 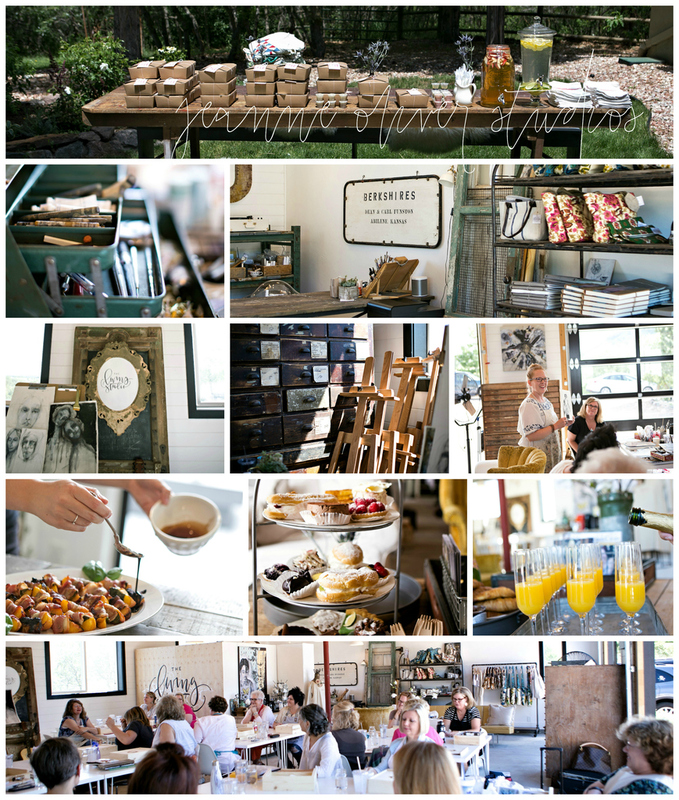 Every detail was thoughtfully prepared, from the exceptional food to the beautiful music that floated throughout the space to the creative lessons we learned. Jeanne is an exceptional woman with a beautiful soul – she is a generous teacher who is attentive, encouraging, and nurturing to every person in the room. 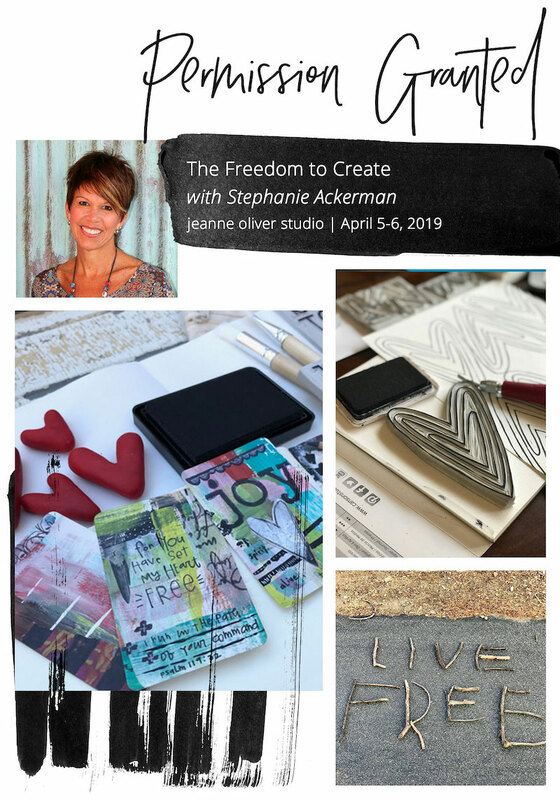 Whether you’re just beginning your creative journey or a seasoned artist, you will walk away from her workshop with your heart full and your mind overflowing with ideas. The work we created was deeply personal and transformative, and I can honestly say, that my approach to art will be forever changed by this remarkable experience. Attending a live workshop at Jeanne Oliver’s personal art studio in Castle Rock, Colorado was an experience that everyone deserves to enjoy. The beautiful studio is set in a gorgeous wooded surrounding with paths for walking and open areas for picnicking. We were spoiled with picnic lunches prepared by Jeanne and her family. There was something for everyone! It was the perfect retreat for refreshing and although I thought it would be the only time I would travel for a workshop to Castle Rock, I have been planning for another visit soon. Jeanne has a well-stocked studio and this is a real advantage for travelers. The biggest treat for me was having our final lunch in Jeanne’s amazing home with her warm and engaging family. It was wonderful to meet new artist friends too. We have all continued to inspire each other and reflect on the special time at Jeanne’s. I truly cannot say enough about the character and integrity of Jeanne Oliver and her family. You just feel good being there and getting to know these beautiful humans. It was an experience I will not forget and I can’t wait to do it again! 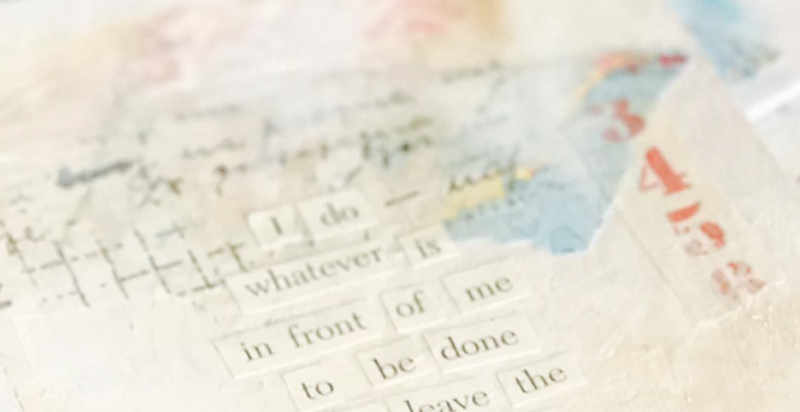 Jeanne Oliver’s workshops are a beautiful gift. The art, the food, and the hospitality are beyond your wildest expectations. Jeanne’s attention to detail creates a beautiful space for all who attends. “My cup overflows with joy, peace and inspiration”—- is how I felt after attending my first workshop at Jeanne’s Living Art studio. Experiencing a workshop a Jeanne’s will not only inspire your art heart, it will minister to every part of your creative soul. You will experience touches of love, beauty and wonder everywhere: in her genuine hospitality, words of encouragement/teaching, and the delicious meals are also a feast for your eyes! The studio is a bright and joyful place where you will be able to gain new insights, make new friends, and ignite your creative Spirit. I have a job where I am continually pouring out on others, and while I love it, it can leave me weary and depleted, so coming to the workshops at Jeanne’s have become an important part of my self-care. I have found a place at the Living Studio that refreshes all parts of my creative soul – mind, body, Spirit and heart- and I am very grateful. No wonder it’s called the LIVING studio.